After what had been quite a busy week already, Nita and I decided to make the best of the fine weather and go for another walk. 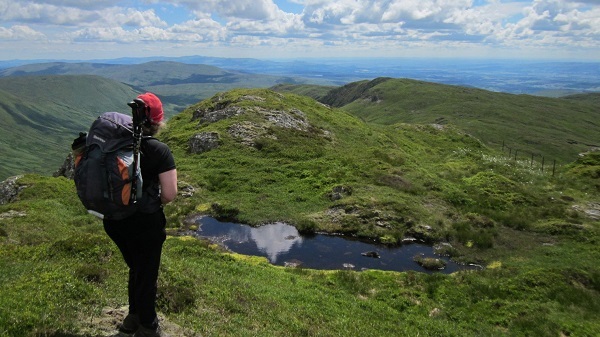 For quite a few years now I’ve wanted to climb Stuc a’Chroin, the neighbour of Ben Vorlich in the Southern Highlands. 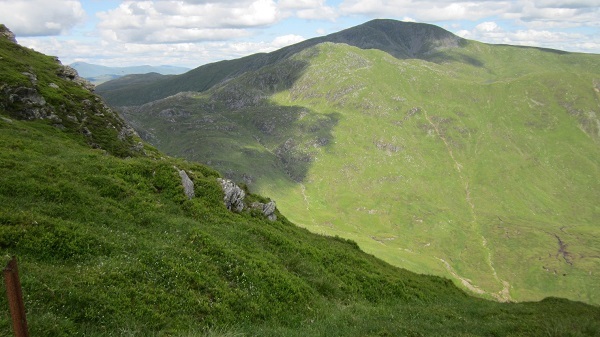 I decided that I would like to climb it via the smaller top of Beinn Each to the south and then along the broad, knobbly connecting ridge. It would make quite a long day as the only way back would be to retrace your steps back over Beinn Each. Well then, yesterday was going to be the day. We started quite early and drove up to the hill under almost cloudless skies ….it looked perfect. Perhaps though, in retrospect, it was a little too perfect for a long day! I’d forgotten just how steep a pull up it was to reach the summit of Beinn Each. Hardly surprising really seeing as we’d last walked this hill perhaps eight or nine years ago and if I remember rightly, it was a grey and misty damp day with little or no views higher up. The path itself isn’t a bad one when you can see, but for me it was quite difficult and about half way up where it scouted around the edge, above some good size crags; we went off paste and made our way straight up. The going was much easier underfoot as we were on a mix of grass and heather but it was very steep in places. The views were spectacular though in the bright hot sunshine it really was quite sapping on the energy. 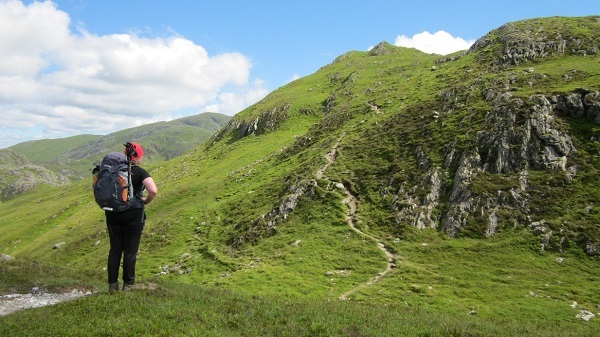 As we approached the top and saw the view towards our main hill, Stuc a’ Chroin, our spirits flagged…..it looked a long two and a half kilometres in this heat. 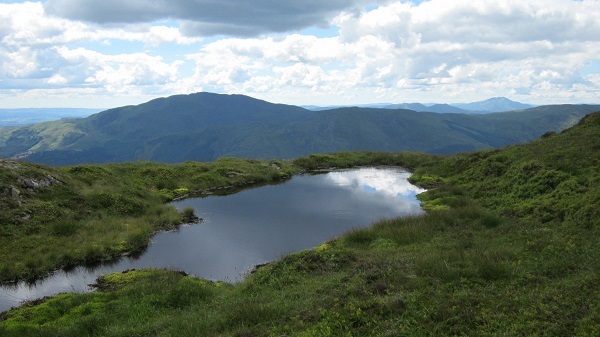 Having spent the last 20 years learning how to adapt how I do things, I decided that it was perhaps time to adapt our route…..we’d call it a halt here at the top of Beinn Each and instead of having a tiring, hot and sweaty haul to Stuc a’ Chroin and back, we’d make camp here and sit and enjoy the views of it for an hour or so! I have to say, that Nita was in full agreement and would possibly have mutinied if I’d even suggested trying to carry on! We sat down, dug out the lunch packs and simply enjoyed the views ….although Nita later suggested I had done so for a short while ……while snoring! And that is really about that, except for a rather disturbing incident on the way down. We’d stopped to take some photos of Stuc a’ Chroin when we suddenly had a large insect buzzing around us. It definitely wasn’t just a large bumble bee as it had a much deeper louder bussing sound. And it was very persistent. Nita said that it was large and torpedo shaped…..and it seemed pretty aggressive. We tried to move away as quickly as possible but this wasn’t too easy for me on what was quite steep ground, especially as I was also flailing my walking poles around trying to fend the bug off!!! For anyone who was watching it must have looked like that scene out of Mr Bean when he was bothered by a wasp! The thing came back repeatedly for about five or six minutes I guess before finally losing interest. Phew!